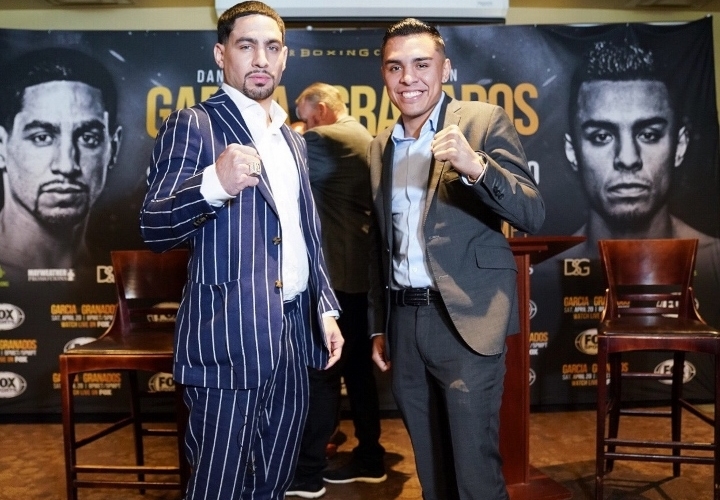 Four months after first being introduced during Fox Sports’ initial schedule rollout, Danny Garcia and Adrian Granados finally have the floor to themselves. The pair of welterweights will headline the April 20 edition of Premier Boxing Champions (PBC) on FOX, live from Dignity Health Sports Park in Carson, Calif. The bout was made official months ago, but formally announced during an intimate press session held Tuesday at The Palm in Los Angeles. “April 20… this is another fight for my legacy as I look at it,” insists Garcia (34-2, 20KOs), a former two-division titlist who fights for the first time since a close loss to Shawn Porter in their welterweight title fight last September. “I’ve had a lot of great fights in my career. This is another important fight of my career. Garcia headlined the very first edition of PBC on Fox in Jan. ’16, claiming a 12-round decision over Robert Guerrero at Staples Center in Los Angeles. The Philadelphia-bred boxer—who turns 31 on Wednesday—has fought most of the best at 140 and 147 while serving as among the regularly showcased athletes within the PBC circuit. On the other hand, Granados (20-6-2, 14KOs) has spent his career on the outside looking in and often at the expense of being shorted on the scorecards. The 29-year old from the greater Chicagoland area remains best known for his upset knockout win over then-unbeaten contender Amir Imam, but having to wait well over a year to cash in on the opportunity. He landed a plum assignment versus Adrien Broner in Feb. ’17, but having to travel to his opponent’s Cincinnati hometown where he dropped a close and hard-fought 10-round decision in their Showtime-televised headliner. A subsequent loss to Shawn Porter later that November has been followed by a three-fight unbeaten streak but by far his highest profile fight in years. [QUOTE=NachoMan;19602601]Hm, you've got some kind of hard-on for Garcia. [/QUOTE] You know I’m right since you have nothing to respond with besides another insult.